One or more photo(s) has been virtually staged.Seller will pay 2 years of HOA fees at closing. This is a value of $10,000.00! Beautiful sunset and sunrise views from the front and back second level balconies. Back lower level has a large screen enclosed lanai with a spa. You can relax in your spa looking out at the water view. This home has a deeded dock included, which sits directly behind the home. This is a two-story town home. It has new carpet and newly painted interior. There is an additional 800 sq. ft. bonus room downstairs with a half bath. The one car garage can be made into a 2 car tandem garage very easily. The master bedroom has vaulted ceiling, an office or sitting room which leads out to the back balcony, a walk in closet, master bath with two sinks, separate shower and soaker tub. The bedrooms are a split plan. Inside laundry room is upstairs. Great open floor plan with cathedral ceilings gives a sense of spaciousness. The community features a heated pool, tennis courts, clubhouse, grills, waterfront walkways and 24 hour guard. You can sit on your front porch for sunset views, or climb into your private spa on your screened porch facing the channel and your boat dock. 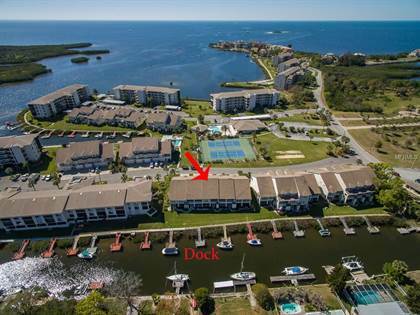 This unit has separately deeded boat dock available. Also there is boat and RV storage in the community. It is like resort living. Hi, I'd like to find out more information about 8234 AQUILA STREET. Thanks so much!